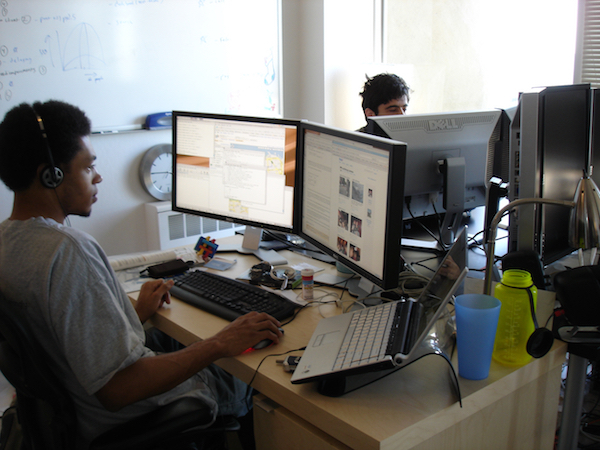 Aston Motes was the first employee at Dropbox. He’s now a startup advisor and investor, and he currently is focused on multiple projects at the intersection of music and technology. Discussed: Studying at MIT, Learning About Startups, Interning in Silicon Valley, Meeting The Founders, The Y-Scraper, Building Dropbox, Learning From Success and Failure, Going Through YC After Dropbox, Choosing Companies as an Employee vs. as an Investor. So on my way out of MIT, I was looking to join startups and subsequently ended up in New York City at OkCupid. I actually had interned previously in Silicon Valley and decided that maybe it was too much tech for me. I wanted to experience New York where there were, I guess, other cultural things. Once I got to New York I realized I missed having a bunch of geeks around everywhere. I found my pocket of geeks in New York at OkCupid, and I had a roommate who was also a software engineer. So I had that network, but I did miss the Valley. There’s a different energy in Silicon Valley versus New York, especially in 2007 when I was there. Craig : So how long did you end up staying at OkCupid? Aston : I stayed at OkCupid for just six months, and those six months were really, really great. But actually, for almost all six months I was being recruited by Dropbox. Essentially what happened was one of the people that I had worked on bookX with, Arash [Ferdowsi], ended up going to YC and co-founding Dropbox with Drew [Houston]. They started working on Dropbox together a few months before I went OkCupid. The whole time I was at OkCupid I was hearing about their exploits. When they started they were working out of an office in Cambridge so I hung out with them there. But, just as they went through Y Combinator in the summer of 2007, I heard news from them about how well they were doing and how many people in YC loved what they were doing. And I’m like, “That’s incredible.” I didn’t know they gave a million dollars to…I mean, literally, kids. Drew is a couple of years ahead of me, but I still felt like a kid, so I thought certainly “that guy is a kid.” In reality, Drew had spent a bunch of time building companies and was working at a startup at the time, so he had a lot more experience than I appreciated at the time. And Arash felt like a kid as well. Arash is a year younger than me and I actually TA’d him when I was at MIT. That was a really big moment in terms of my understanding of what Dropbox was. Before that it was just this cool thing they were working on. Then it was like, “Oh they’re building a business.” And around that time period they were looking for a first employee. Craig : Was there anything in particular that excited you about Dropbox? Aston : So, obviously, those guys. Drew and Arash are super, super smart and great engineers. To this day, I’ll hold Drew as one of the best Windows programmers I have ever met. And Arash is just sick at all things backend. They were this perfect pairing. So, as far as the team went, I was certain that these guys were going to be great people to work with. For the longest time I had seen product demos that were just video. But once I played with the product I was like, “Oh, this thing works. I really like this product and it would be awesome to get a chance to work with these guys, on this thing.” It was a product that, as an MIT student, it matched my expectations for how something should work. Craig : What does that mean? Aston : MIT has this thing called Athena, which is a very old networked computing system. Basically, you can go to any computer on campus, log in with your username and password, and the computer’s desktop, comes up the same with all your applications and files. It’s a super awesome system that you got used to at MIT. If I needed to print something on the run, I could drop into any computing block and my stuff is right there. Craig : That’s really cool. Aston : Yeah, definitely. So from the product perspective, Dropbox made a lot of sense to me. If I didn’t have Athena on my laptop I couldn’t get to my files but with Dropbox I could. Maybe not this whole desktop experience, but at least my documents and my photos and all that stuff. But the Sequoia check definitely solidified my belief in the fact that this could be a real startup; it wasn’t just a project that was going to end very quickly. So I actually tried to help Drew and Arash recruit someone else as first employee, assuming I would just join later. I was like, “You guys are going to be around. Now that you have this check, you guys are going to exist for a couple of years. I’ll just come on later. Let me try to help you find someone else who doesn’t have a job,” because I was working at OkCupid and really liked my job and didn’t want to up and quit. I had a year-long lease in New York that I didn’t feel super excited about paying for while living in another city. So it was like, “I’m probably not the right person to do this. I’m not really in a position to do this.” But my recruitment efforts failed and their recruitment efforts succeeded. Aston : That whole time they had been working on me and I didn’t even notice that they were recruiting me. And I would say the nail in the coffin was, they flew me out to San Francisco to see what was going on. I got to see the apartment, which was not very glamorous, but it was the apartment they were living in and working out of, with a great view of the bay. You could see the Golden Gate Bridge and Alcatraz and of all that. So, it was a cool place to be working and it was just them. The idea that it would be just us working on it was also attractive. And the other thing that was really cool was the community that was around at the time. Their building was nicknamed the “Y-Scraper” because it’s a towering monstrosity in North Beach and it was full of YC companies. That whole neighborhood is low-rises except for this 12 story tower. It sticks out like a sore thumb, but does have great views. At the time Justin.tv, Weebly, Scribd, Etherpad, Disqus and more YC companies were all living in that building. There were a ton of companies. The density of startup people was so high that it ended up being this really impressive thing for me. Like, there wasn’t just Dropbox and this team that I was working on. Around me I was going to have other similarly-minded people. At that point I realized not only would Dropbox be a cool team to work with and a cool product to work on, but it was going to be an opportunity for me to really learn what it was like to start my own company, which as I mentioned before, was always a goal. Craig : What made you not start your own company then? What made you decide to be an employee? Aston : Well, the immediate thing was that I didn’t have any great ideas. I think related to that was I didn’t have a ton of confidence about my ability to run a company, having never have done one before. So I reckoned that being an employee would be the best way to see it, and if it failed, I would learn a bunch. I would learn a bunch, and it wouldn’t necessarily be my fault–I’d just be like that guy who was around. And from those lessons I’d be able to learn all the things to avoid and when it was time to do mine, I would be super prepared. Craig : Totally. So you join Dropbox and move out. What’s it like? Aston : It was just like I expected. It was awesome. Craig : Did it feel like you lived in a dorm? Aston : It didn’t have a dorm feel per se, because everyone was working so hard. You wouldn’t see people randomly during the day. We had pretty weird hours. We would start in the early afternoon and would work until well into the low numbers in the morning. So we didn’t overlap with a lot of the other companies during the week because everybody was working on their own thing. They were maybe a couple occasions I can think of where someone visited us during the day. But on weekends, yes, definitely. It was one of those things where everybody’s personality type is “work hard, play hard” and almost all the companies would take one day to get away from everything and do something interesting. Craig : So what were you actually working on? What part of the product? Aston : So when Dropbox first came out, the demo video had this desktop part and this web part. Drew built the first version of everything. And then when Arash came on they ended up splitting it with Drew on desktop and Arash on web and servers. And then when I came, we split it again so it was Drew on desktop, Arash on servers and me on web. So I built the more modernized version of the web stack and that involved a number of website redesigns. We started the site in an era where IFRAMEs were cool and by the time I left the company we were well into AJAX/XHR and dynamic everything on the client side. I also had a hand in choosing a bunch of technologies that Dropbox ended up sticking with, for better or for worse. Drew picked Python on the web, and he also picked Python on the desktop. But I ended up picking Mercurial for the distributed version control system, which we were definitely wrong on that one–should have picked Git. I also picked Prototype.JS for the web. We were wrong on that one, too and should have picked jQuery. But this is just like a long line of interesting things that happen when you have a startup, where you look at the things that are trending, you look at things that are hot, and you pick the ones that feel good, and then six months later it turns out that your pick wasn’t the right one and everyone is doing this other thing. By now, I think Dropbox has moved away from Prototype.js and potentially also from Mercurial. But it’s funny how long these early decisions stick around the company. Craig : What choices worked out well? Aston : There’s a long line of things we didn’t do that I think ended up being good. And that was generally from being a pretty conservative engineering culture. We tried to avoid things that were trendy and, in general, we just chose things that worked for us that weren’t super complicated. So I think for the most part we ended up have never having to do a complete overhaul of something that was not working. Craig : It’s an interesting point. In the other interviews we actually haven’t talked about the implications of their technical choices. Do you have any broader thoughts on how someone should thinking about those decisions? Aston : My advice for most companies is just use whatever you’re comfortable with. I think a lot of that stuff ends up being “six of one, half a dozen of another.” That said, I’m really happy that Drew chose Python. I wasn’t familiar with Python before I got there. Primarily, I had been coding web stuff in PHP, which Facebook ended up using a lot of. At OkCupid, we were actually using C++. That’s just to say that I was open to whatever language stuff needed to be built in. And I think Python is a really great compromise in terms of programmer productivity and performance. Craig : And so then what were the challenges in the beginning? Aston : For the first year we were not publicly available and primarily we were just trying to actually deliver all the features we claimed we would have. We had a pretty solid mailing list built through interest in a couple screencast videos that Drew had made. It could work like that for one computer for sure, but we wanted it to work like that super smoothly for everyone who used it, across all platforms, and to have a website that complements all that functionality. In fact, for a long time the desktop client had almost no UI so most of the difficult operations, like sharing a folder, happened on the web. So we put in a lot of work building up that experience. And we didn’t launch it until a while after I joined. I forget the exact timing, but around a year in we were ready to launch. So yeah, it was all the stuff that goes into any launch but add on the complexity of having not just the web client but also Windows, Mac, Linux, all talking to the same servers, and we had built the majority of this on Amazon Web Services, but at the time they were… not quite as reliable as they are now and definitely not as extensive. I think they just had EC2 and S3 back then. Once we actually launched, work became fighting fires around customers problems or us needing to ship features and things like that. The first year or so was calmer. It was just a lot of heads down work. Craig : Did you have a certain number of users in mind when you were writing V1? Like, “Okay, we can handle, whatever, a million people with this.” Anything like that? Aston : Oh, interesting. Yeah, I actually didn’t spend that much time thinking about how many people we would reach, but it was certainly a consideration, primarily on the folks who were for doing scalability stuff. I was more concerned about the user experience and what would make Dropbox successful. Just to set context here, there were a lot of companies we were competing against in backup and file sharing. Ultimately, I think what differentiated Dropbox was user experience and really never screwing up, like deleting a file or anything like that. And if you were using Dropbox you could be pretty certain that whatever you were doing, the interaction was going to be easy. So that was a super big focus for me. When I thought about scale, it was more about how many people are going to run into this crappy case? Or how bad would it be if we did something in a funky way that worked 90% of the time? Because we also needed to, obviously, ship. A specific example was backend records when someone added and then deleted files. Dropbox didn’t at the time track renames whatsoever. And a rename would encompass a move as well. So, when I joined the company, if you moved a file from directory A to directory B, you deleted this file and then you added this file. From a technical perspective that’s weird and doesn’t match what actually happened: It was actually moved on disk, not added, then deleted.. But also it mismatches anybody’s reasonable expectation of what they would see there. We spent time trying to apply heuristics to try to understand when people moved files. In that simple case, since the file contents don’t change and the add and delete come together in a small time window, it’s pretty easy to tell that the file just moved from A to B. But when someone moves a directory with 5,000 files and directories, they don’t all come in one file change set, they come split across multiple change sets. And it’s not all at the same time. You can naively compare all the file contents but it ends up being really slow. We went through multiple versions of this movement matching thing before we got to something we felt was performant. But it’s a good example of where performance issues sneak in around scale. And it’s not people-scale, it’s like file systems-scale, which is a different dimension. Craig : What were the fires after you launched? Aston : The first one’s hilarious. We launched publicly at TC 50, which later became TechCrunch Disrupt. Basically the format of this is, you’re on stage in an auditorium with thousands of people watching. Also on stage is a panel of judges – respected entrepreneurs, journalists, venture capitalists – and you get your X number of minutes to pitch, and then at the end of it they give you feedback… in front of everyone. They were streaming it online so when Drew went to pitch with Arash everybody was in the office watching the live stream. But actually what we were watching is our computers with logs of the server. We were deathly afraid that this demo would fail in some way. So we’re watching the live stream and the server logs look great. We’re monitoring Drew’s account specifically to make sure everything’s going through. We’re ready to fake it if we need to–like throw a file in there from our side. Then partway through the pitch Dropbox seems to stop working on the live stream. Craig : [Laughter] So how did the demo go? Aston : So by the end of Drew’s like, “If the internet were working, this is what you would have seen.” But it really killed the magic. One of the judges was like, “I don’t get it.” And this was a legit person who we respected and thought would love it. Then we just got creamed on stage. It didn’t help that the presentation before us was Swype, which was this awesome, magical keyboard. They had the best demo in the world and then ours didn’t work. So, we started out with fighting fires from day one. Craig : And what about when the users arrived? Aston : Yeah. We definitely had scalability issues, we had bugs, the same stories everyone does. I think for the most part, Dropbox had a very blessed experience. One of the ways we were blessed is we really didn’t screw up in the worst way possible, which is lose a bunch of people’s files all at once, in unrecoverable ways. We had built out the system such that when we did delete something, we left a time when we could do recovers. We had written the clients well enough so that we were unlikely to mess up the bits and prompting of the server. But there were definitely incidents where data got deleted and we had to go recover it. There were definitely incidents where stuff would just not work for people, which is obviously no fun. The funniest one wasn’t really harmful to consumers but it was harmful to our business. The Dropbox desktop client had an auto updater feature and one time we shipped an auto updater that broke the auto updater. Craig : [Laughter] That’s awesome. Craig : I’m surprised you caught it that fast. Aston : I don’t remember how we caught it, to be honest. But I mean, it’s a reflection of the engineering culture we had. We were all using the product so when there was funny stuff we tended to catch it. And we tended not to ship it out to too many people until we were certain it was rock solid. Craig : Okay, and so what was the environment like when you launched? I assume you didn’t live in the YC skyscraper forever. “Yeah, I’ll ask him.” And then fast forward a number of months later and they worked with us. We had a great recruiting pipeline but a not particularly interesting one. I think of the first 12 or 15 people who joined the company, almost all of them were MIT graduate or MIT students who dropped out to hang with us for a summer. Craig : So how did your relationship with the founders shift as Dropbox grew? Aston : Hm. I had been a TA to Arash so in my mind he was like a younger brother, but then he became my boss immediately when I joined the company. Though I think that’s the way the working world works–your relationship with people will change as you work with them. I think that particular relationship ended up fine. Dropbox was super, super flat and allergic to management in the early days, so pretty much everybody just worked on their own stuff and there wasn’t this sense of, “Oh man, this kid is bossing me around again.” It was never like that. I do think all of us became much better friends but also, because we were spending so much time with each other, got a little bit of cabin fever. But overall, we worked super well with each other and had really high bandwidth communication because we had all come from the same place. Craig : And how long did you stick around? Craig : Meaning you’d hit a milestone? Aston : Yeah, that project was a big milestone and I didn’t have another big project waiting for me at the time. Also, the company had grown such that I didn’t feel like I was a bottleneck. I wasn’t this person who needed to be around to make sure stuff happened, which is what it was like when I first joined. I thought, “I can give myself permission to leave. The company won’t die, they’ll be fine. And I can go off and do any of the random cool stuff I want to do.” So I left Dropbox and did YC the following summer. Craig : Cool. What was the startup? Aston : I was fascinated at the time with what now is literally a joke on “Silicon Valley”–social, mobile, local. The idea that we’ve got these cell phones that are a marvel of technology. And the convergence of the ability to communicate instantly seemed like a natural fit for this thing that was happening to me, which was wanting to hang out with friends at a random moment. It’s Friday night, I’m not doing anything, where is everybody else? I was fascinated by that question and I built a number of apps over the summer to try to address the problem. But I actually didn’t end up even publicly releasing any of them. I have pretty high standards for what I thought would be super valuable and I just felt like I wasn’t there. I had a really good sense of what the problem was but I didn’t go into the summer with a clear sense of what the solution would be. While building those apps I talked to a number of founders who had dead companies in the space. Just like graveyards worth of people who were trying to work on a similar problem. Some of them ex-YC, some not. Even with all of their wisdom and my own gut instinct, I never really got to a product that I was super proud of. Craig : So did you demo anything at Demo Day? Aston : I didn’t. I think I realized it wasn’t working a little bit before Demo Day. I took the last little bit of time before demo day to really reflect on whether or not I wanted to continue trying to solve that particular problem. I realized that if I raised money around solving the problem I wasn’t sure I was ever going get anybody’s money back. Craig : Wow, awfully moral. Aston : Yeah, I take all of this stuff pretty seriously and like I said, had a really high bar for what I thought would be valuable. Yeah, just didn’t do it. You know, I tell people maybe the worst thing about Dropbox was that it went so well. I didn’t learn many bad things. I learned about things that come with success. And a lot of times with startups it’s more valuable to learn the things that come with failure. Craig : That’s a great point. What other lessons have you learned that Dropbox’s success may have covered? Aston : I didn’t have as strong of an appreciation as I do now for just how valuable it is to actually pick a great idea that has a great business behind it. It was some youthful naiveté that I think I’m beyond now. It seemed so easy with Dropbox. As far as I knew, Drew woke up one day with this idea and we built it. If you go read the YC application for Dropbox, we built literally what Drew said and almost every competitor Drew called out built exactly what we thought they would. And the only difference between the story there and the story in real life is that we didn’t get killed and that we ended up building a business. I don’t know if Drew even estimated the business could be a billion dollar business, but he definitely thought that we had the same type of customers as we ended up having in the early days. Aston : It was an incredible thing to see an idea that we all thought was good actually work. It was a bit of a surprise, I’ll admit, that when I had an idea that I thought was good, it didn’t work! And that’s a way more typical story for startups. Craig : Do you have any advice on vetting ideas? Aston : I’m a big believer now in founder/idea fit. I don’t know if that’s the right term but that concept’s definitely a real thing–matching what you’re building to what you want to be building. And I don’t just mean product, I mean company as well, and maybe company is the more important part. There are certain business ideas out there that I think are pretty awesome that I never want run myself for a variety of reasons. Some ideas are really, really sales heavy and I’m not a salesman. Some of them are about scale. There are definitely ideas out there that can make you hundreds of thousands of dollars a year but my ambition is for something bigger. I think there’s a lot more that goes into committing yourself to a long term project than I appreciated. And I don’t know if Drew and Arash would have committed to Dropbox if they knew it was going to take them a decade. A decade of their lives. I’m sure they love it. I definitely loved being a part of it too. But that’s just to say that, I didn’t fully appreciate the commitment needed to fully see an idea through. My time in Y Combinator was like my grad school on founder/idea fit. I was working on this idea and on this problem that seemed real to me but wasn’t shaping up to be the type of business I wanted to build. So yeah, I didn’t build it. Craig : Does that belief ever keep you from jumping onto projects? Aston : Yes, definitely. I think the coping mechanism for not wanting to do something that doesn’t match your ideal is just as you said, to just not do anything. What I did to get over that was instead of spending my time trying to the perfect startup idea, I just started playing again. That was on the advice of a number of serial entrepreneurs and people who had had these great exits. Before discovering that letting go process – this was partially related fact that I was in Y Combinator – it felt like such a big thing for me to let an idea go. To say, “You know what, this isn’t it. I really want it to be it, but this isn’t it”. Now my mindset is, easy come easy go. I came up with that idea in a day! Why would that be the thing that I would spend the next five years of my life on? That’s definitely a change of mentality for myself as an entrepreneur. My time since Y Combinator has been filled with lots and lots of little projects that have been extremely valuable for me in terms of learning. Some of them have made some money, some of them have not. None of them yet are the decade-long commitment thing that I would love to get to. But yeah, I think it’s all part of the process. Craig : Man, I’m very impressed that you’re so astute in a business sense but also morally and technically. It’s cool. Craig : Definitely. Ok, so you’re an investor now. Can you explain how you vet companies as an investor versus as an employee? Aston : Sure. So the reason investors have a portfolio is because it spreads out your risks, right? This company may fail. This company may 10X. This company may 100X. They offset each other. But as an employee and particularly a first employee, you’re really giving your life to this thing for however long it’s going to be alive and that’s a different sort of commitment. If I were looking to become a first employee, first off, I’ll say that being a first employee is actually a pretty tough role. You’re basically a founder, in terms of the responsibility that you have and in terms of the emotional weight that the company will have on your life. You won’t be able to get away from it the same way employee number 50 or 500 will. To that end, I think it’s important to make sure your personal life lines up with the company. It’s different for everyone but for me it was my first year out of college and I wanted to make sure I worked with people I really liked and trusted. Because you can write anything in a contract, but when it comes down to it, it’s very easy to break the contract and you have no recourse, right? I trusted Drew and Arash, basically, with my life. I was like, “These guys are great people and I can’t see a future in which they would do me wrong.” You need to really feel like you want to be associated with the company. For better or for worse, Dropbox is going to be on my resume forever. That last one’s a weird one. I think a lot of people end up working on things where they’re like, “I love this, but anything else, I hate.” That’s a bad attitude for an early employee because I think your responsibility, ultimately, is to stick with it longer than other employees and almost as long as the founders. You can get out a little bit earlier, but it does look bad when early employees are bailing. It hurts companies. Being a first employee is a really, really big responsibility and you should be ready for it. As a young person I don’t think I understood how much responsibility I was stepping into but I mean, it was pretty easy for me to make that step because I felt so much confidence around the team and around the product. I knew I was going to learn so much that even if it didn’t work, it would be worth it. Craig : As an investor, how much time do you spend investigating the business versus the founders? Aston : [Laughter] Yeah, that’s level of financial modeling I was experiencing at Dropbox. I’m sure Drew had stuff with the investors that was a bit more sophisticated. But yeah, as an employee you can’t make a portfolio, which means you would have to be right. And it’s very hard to know if a company is going to work or not. So I don’t think that could be a part of your calculus as an early employee. Craig : Totally. All you have is the portfolio across your career. You get some amount of chances. Aston : Yeah. That, I would say, is a good thing about small startups: they tend to fail fast. So, you know, if your company is failing every year and a half or so, you can get a lot in before you start getting up in the years. Craig : So, related to finding startup opportunities. It seems like at MIT you were at the right place at the right time to meet people. How do you think about meeting new people now ? Aston : That’s changed a lot since I moved here. My advice, actually, is to move to where you have lots of opportunities to run into interesting people who are doing cool stuff. My move to New York was probably not the best one in terms of networking around startuppy people. I don’t regret going, but if I had I moved immediately from college to Silicon Valley, I would have had way more people around me who were entrepreneurial and would have raised my chances, not only of finding an opportunity like Dropbox, but also potentially finding a co-founder and doing my own thing. I think getting around a place where the people think the way that you want to be thinking is super valuable. Craig : And what about vetting them? Aston : That’s tough. MIT is cheating. Going to MIT you end up getting to meet lots of people who are smart and fun to hang out with and you’ll get along with naturally. It’s much harder after school. Craig : Agreed. Ok, last question. Do you have any book recommendations? Aston : Let’s see. For business books, I really like Ben Horowitz’s The Hard Thing About Hard Things. It’s like the opposite of my Dropbox story in ways, so for me it was really eye opening. This idea of taking some people who are super experienced entrepreneurs, who have great connections, who have a billion dollar business idea, and then watching how crazy things get and how many ups and downs there can be on the way to success. It’s fascinating. And style-wise I just love it because it’s very casual and easy to read. On the non-business side, I absolutely have to recommend Ta-Nehisi Coates’ Between the World and Me. He does a great job using his own personal experience as commentary on the rest of America. It may feel a little bit heavy-handed to some readers, but I think it’s heavy-handed on a really important set of issues about institutional racism. It’s about how this whole system that we have impacts a lot of people’s lives in ways that often go unrecognized. It’s a really great book, and it’s pretty short too. Craig : That’s great to hear. Ok, let’s end there. Aston : Cool. Good to hang. Craig : Likewise! Thanks for your time.